After more than two decades, Taiwan director Chu Yen-ping's Shaolin martial arts comedy franchise will finally return to cinemas in the Chinese mainland on Friday with Oolong Courtyard. The new comedy continues the story of Master Changmei (Hong Kong actor Ng Man-tat), his disciple Xiaowen (Taiwan actor Fok Siu-man) and their adventures at Shaolin Temple. Chu's 1994 movies Shaolin Popey and Shaolin Popey II: Messy Temple were great successes that are still remembered fondly by China's post-1980 generation. 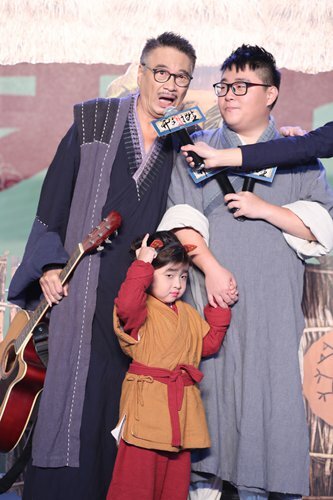 At a media event on Tuesday, Chu said he hopes the upcoming movie can help people recall their childhood memories and bring more laughter into their lives.